Hey everyone! Sorry for the week long hiatus. With just over four weeks left until the wedding, I'm running around like crazy trying to finalise all the outstanding bits and pieces. I am feeling a little stressed and tired, but I'm sure it will all come together nicely on the day! 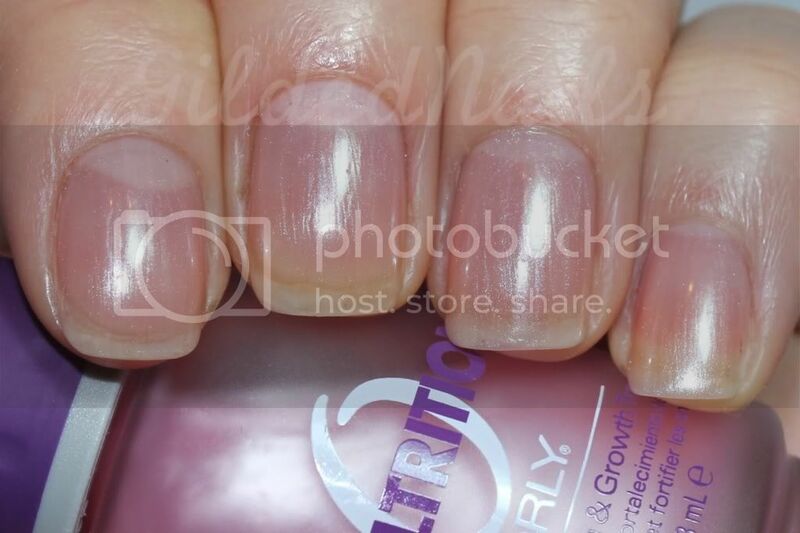 For today, I have a review of Orly Nailtrition, which I have been using on my nails for the past three weeks. With the added stress of the wedding, I have noticed that my nails are suffering a little, so I was curious to see what this product would do for them. 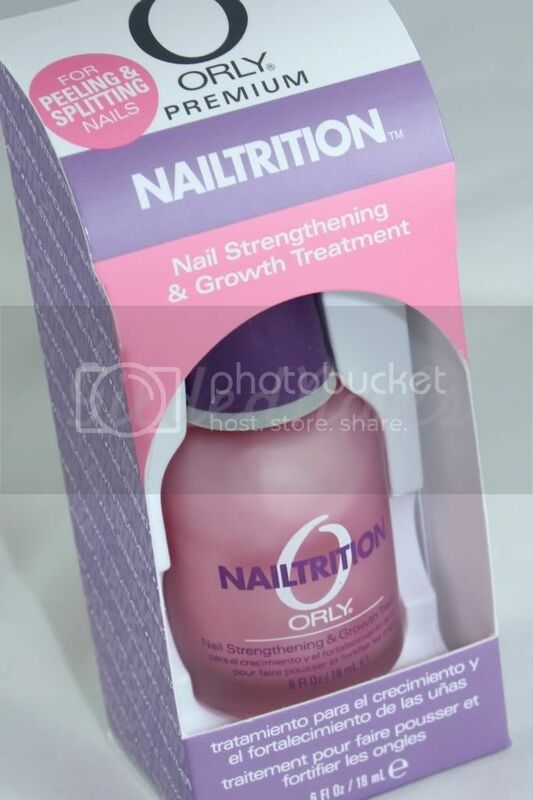 According to Orly, Nailtrition works to relieve severely damaged, weak and slow-growing nails by stimulating the natural, healthy growth process. Nailtrition is infused with strength-promoting collagen, bamboo extract, protein and keratin which helps prevent and repair peeling, splitting, cracking and chipping. 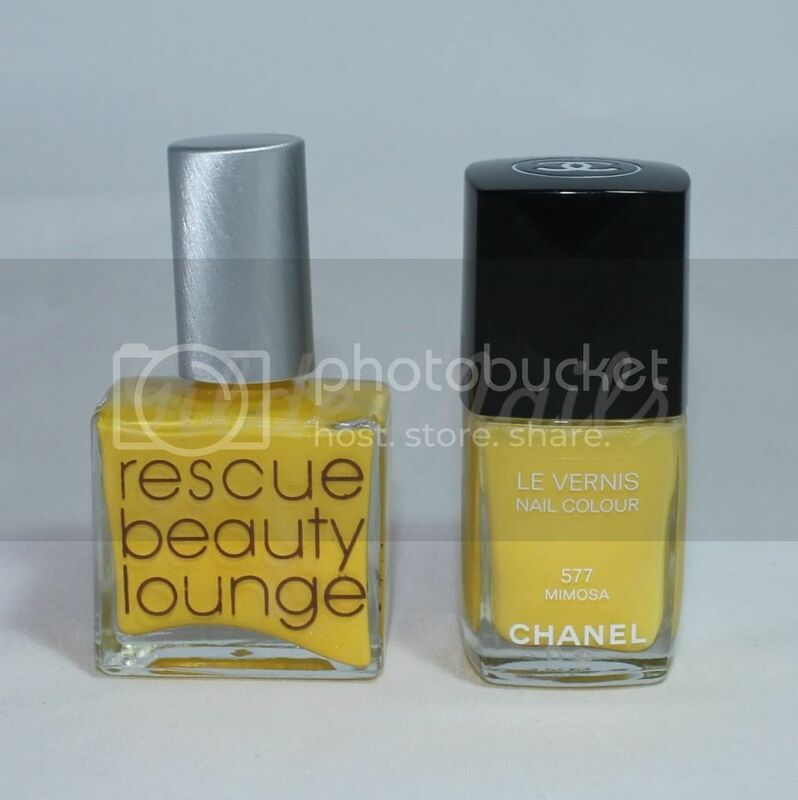 Orly recommends the product be applied daily for two weeks to reveal beautiful, longer and stronger nails. As I said before, my nails were in pretty bad shape when I got this product. I normally hate extra large photos, but you need to see that they were honestly wrecked! Huge chunks of nail would peel off without any encouragement at all leaving a wafer thin piece of nail which subsequently would split and crack. 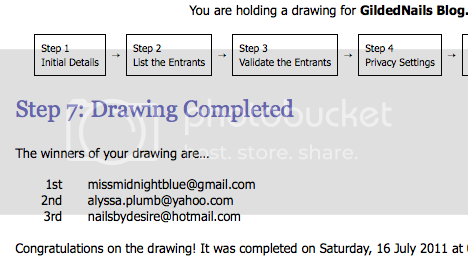 This meant eternal nubbins and many tears. Check out the carnage below. As instructed, I applied Nailtrition to my nails on a daily basis. Because it has a pink hue and a subtle shimmer in it, most times I wore it all on its own, but I also used it as a base under other polishes. After two weeks, I definitely noticed a significant improvement in my nails. My nails felt stronger and the peeling had subsided considerably. I was pretty impressed, but I felt the product could do even more with a little more time, so I extended the trial to a third week. I think the results speak for themselves! The two photos below were taken three weeks after starting the treatment. 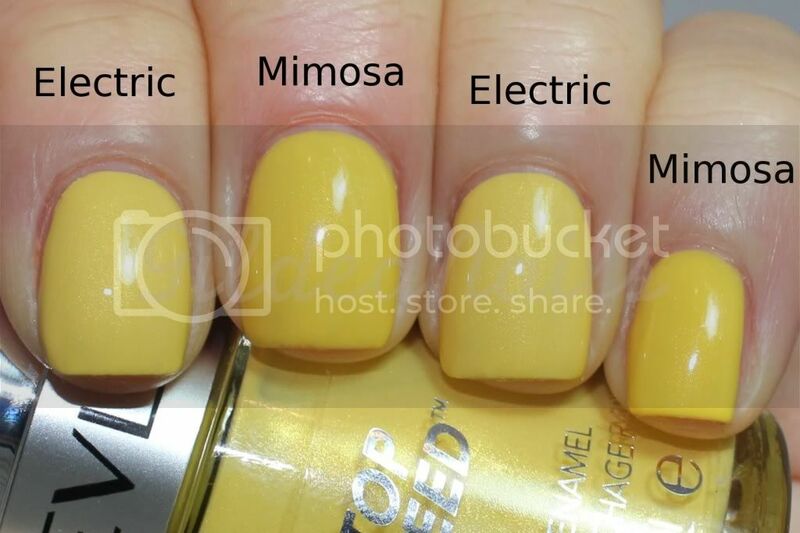 The first one shows what the polish looks like on the nails, and the second is of my naked nails in all their glory. You can see how my nails have grown considerably, and the new nail at the base looks pink and healthy! 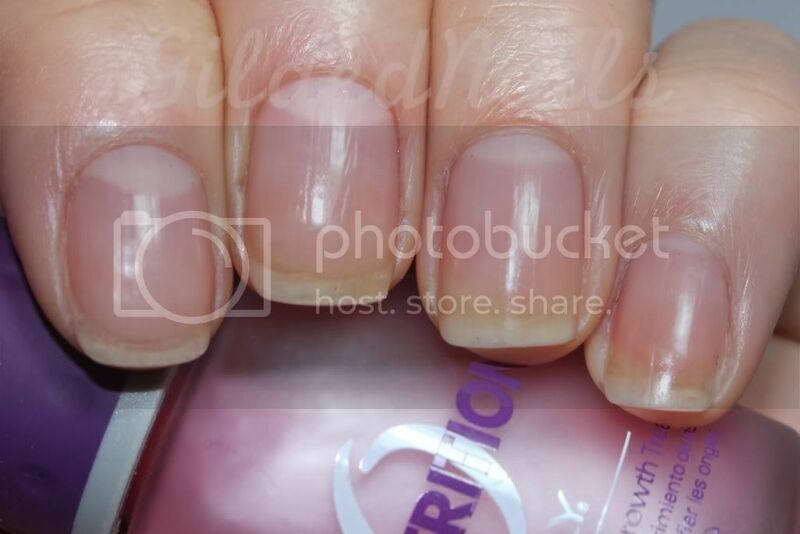 The tips still look a little unattractive, but there is little you can do for a nail at that point, except for file it down and wait for the healthy nail to grow out with the help of Nailtrition! My verdict? Despite using OPI's Nail Envy for years, I am seriously considering converting to Orly Nailtrition. I'm not going to lie, I was a little skeptical as to whether this product could stop peeling and splitting in my nails, but it seems to have made a real difference to the health of my nails. Unfortunately, because I have the coordination of a newborn colt, I broke one of my nails last week in a run in with my car door, so I'm back to nubbins again! However, the peeling and splitting is definitely subsiding and my nails are looking healthier every day! Hopefully with continued use, they will be in tip top shape for my wedding! OPI Pink Ribbon Limited Edition Lacquer: A Shattering Pink Ribbon Partnership! "Showing your support for breast cancer during the month of October has become a fashion statement; OPI wishes to celebrate their partnership with the National Breast Cancer Foundation with their limited edition Pink Ribbon Shatter texturing treatment product, the new fashion statement in nail art. During the month of September and October, OPI joins forces with the National Breast Cancer Foundation, for our 7th year as silver sponsors, where 100% of profits from the sale of the limited edition Pink Shatter will be donated to the Foundation. The revolutionary new Pink Ribbon Shatter is a texturing treatment formula that transforms as it dries on your nails. When applied, OPI’s Pink Shatter begins to shatter and disappear, leaving behind a shattered effect in matte within minutes of it being applied onto an OPI lacquer shade. 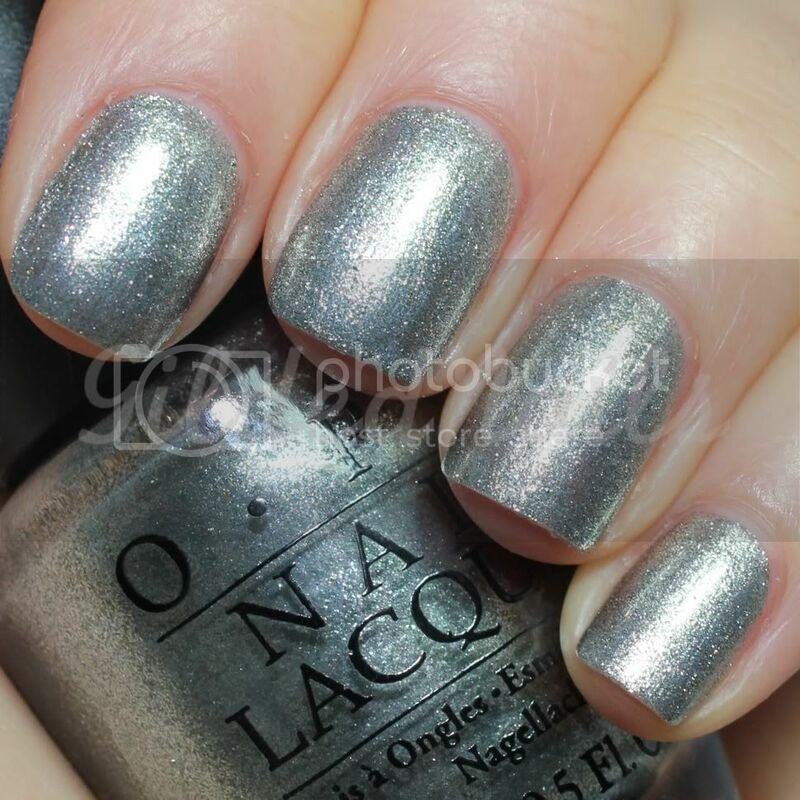 For a high gloss finish, seal the shatter effect by applying another coat of OPI top coat. OPI’s Pink Shatter offers a new dimension to nail design, the cracked pattern effect, similar to a pink leopard print, offers another form of fashion statement in nails. OPI aims to raise another $25,000 for the National Breast Cancer Foundation and assist in their funding of research programs into the prevention and cure of breast cancer, which affects 1 in 9 Australian women. OPI’s Pink Ribbon Shatter will be available from September through to October at selected beauty salons, spas, and David Jones nationally, $19.95 RRP incl. GST. For your nearest OPI stockists contact 1800 358 999 or visit www.opi.net.au." Hey everyone! 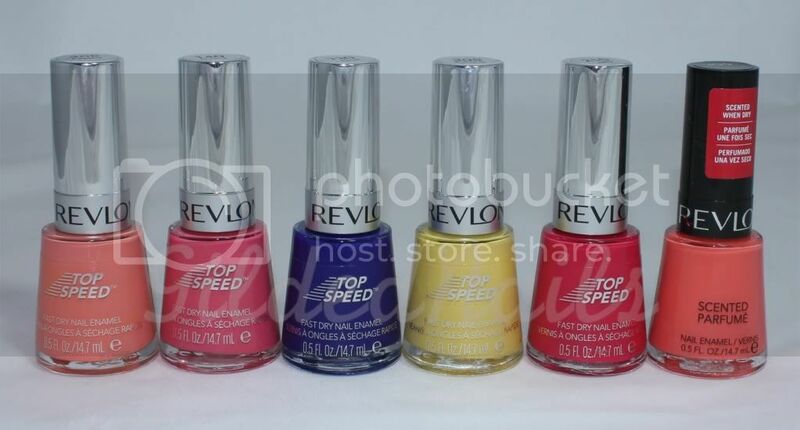 A couple weeks ago, the lovely Diana from the girl with a bow kindly sent me a bunch of the new Revlon Top Speed polishes that I had been lemming and today I'll be showing you swatches of one of the colours, #405 Peachy. Peachy is a orange leaning light coral cream. I had to use three coats to get even coverage because it was still patchy after the second coat. Naturally, it dried quickly being a Top Speed! 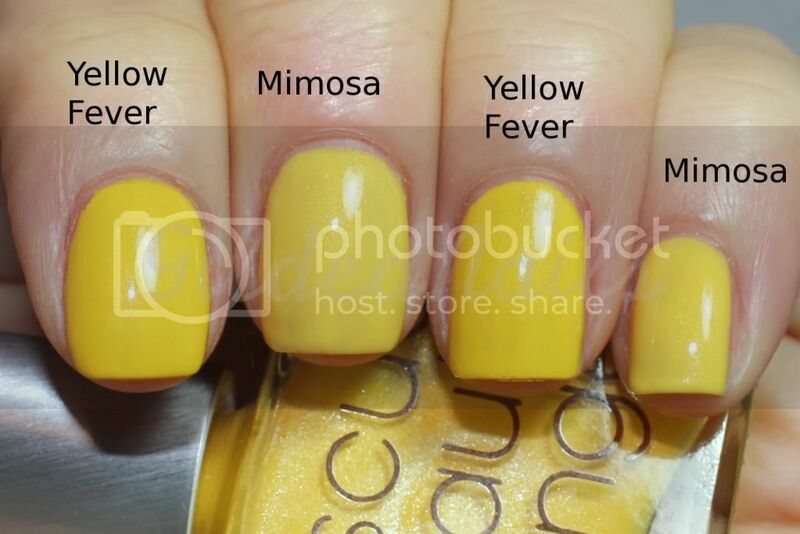 I can't even express how much I love this polish! It is such a fantastic shade of coral! This is going to sound crazy, but my nails look almost good enough to eat with this polish on! Don't ask me why, but they just do! (I promise I don't make a habit of eating nail polish! ha!). 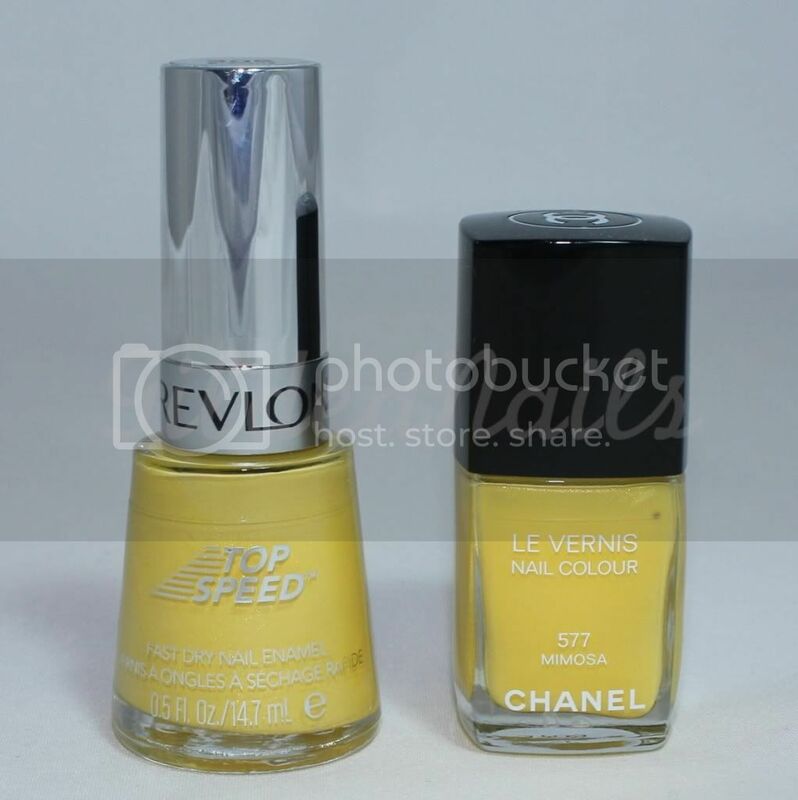 One thing that really impressed me was the fact that Peachy actually had a pretty glossy finish when it dried, unlike other quick drying polishes I have tried before (including Revlon's Top Speed in Royal) which have dried to a satin, rubbery finish, kind of like the Orly Plastix polishes. 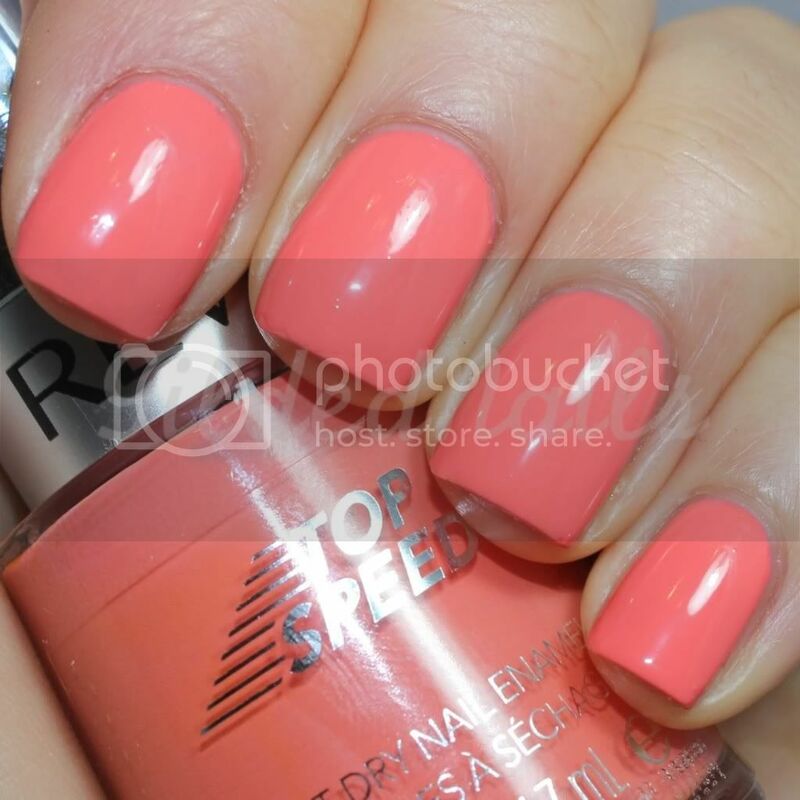 I'm not a fan of satin finish polishes, so its great that Peachy doesn't do this. Peachy also reminds me a little of Essie's Tart Deco. What do you guys think? If I remember, I'll try and do a comparison so we can see how close they are. Thank you Diana for sending these to me! I love all of them and can't wait to try the others! Hey Everyone! 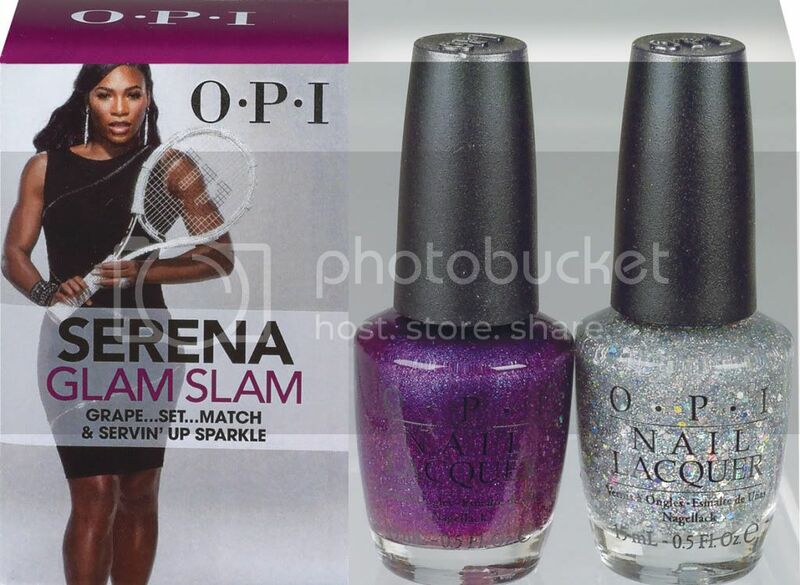 Today I have swatches of the second set from the Serena Williams Glam Slam! England collection which features Your Royal Shine-ness and Servin' Up Sparkle. When I first saw the press releases for this set, I was a little disappointed to be honest. 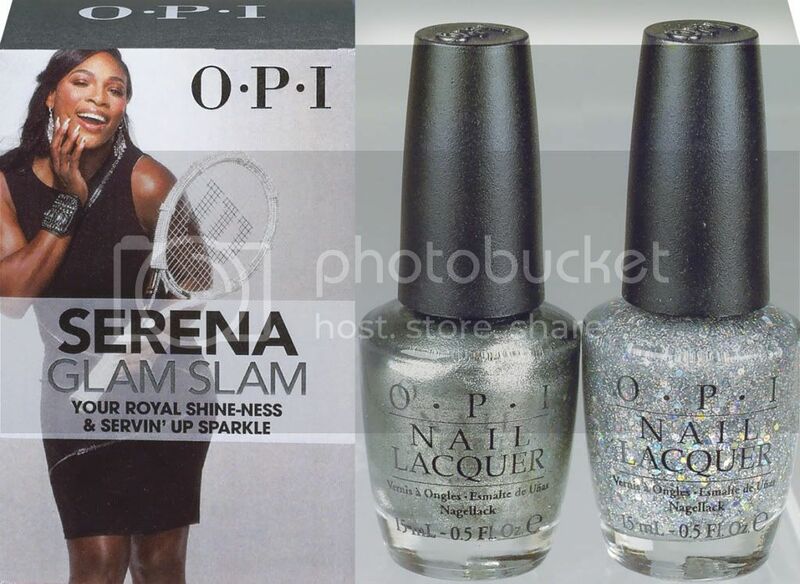 I thought it was just another metallic silver with the same glitter top coat as the other set. Thankfully, I was pleasantly surprised by Your Royal Shine-ness (YRS) once I applied it! Unlike the other silver metallics/foils in my collection, YRS has fine gold glitter in it which brings a little warmth to the polish and gives it a kind of "old world" look, like expensive polished silver. 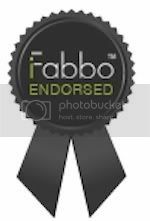 It applied very easily, with minimal brush stroke marks and dried very fast. This was two coats, without a topcoat. I then added two coats of Servin' Up Sparkle, which is a clear "topcoat" polish with silvery holographic glitter and holo hexagonal sequins. In bright lighting, this combo definitely sparkles, however, I think I would have liked a different coloured glitter top coat in this set, so there was a bit of contrast between the base colour and the top coat. It is still a really gorgeous combo, but I feel like Servin' Up Sparkle gets a little lost on top of YRS. 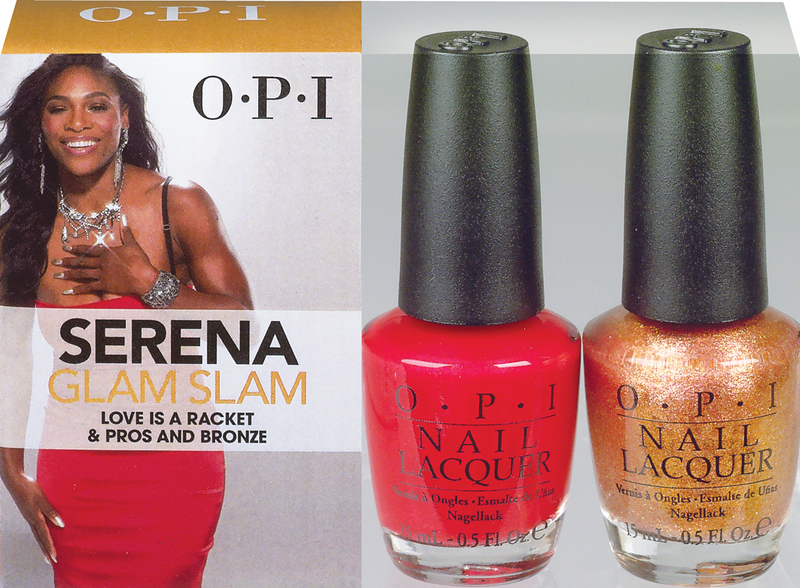 Overall, I'm really diggin' all three of the polishes in the Serena Williams Glam Slam! England collection, but I think the Grape... Set... Match duo is my favourite out of the two. Hey everyone! Just a quick post to let you all know that the lovely Lara (aka swatchgirl.com) has recently put together a fantastic list of Aussie Beauty Bloggers which I really want to share with you.